Shop for pet products now and pay later with Afterpay. Our online Afterpay pet store makes your purchases manageable by breaking them down into 4 smaller fortnightly payments. It's like lay by, but easier. Get the pet supplies you need for your animal today with Afterpay from our online pet shop. Type Of Pet Products I Can Buy With Afterpay? You can purchase almost any type of pet suppllies with Afterpay. Some of the popular items that people purchase with shop now, pay later solutions are dog supplies including dog food, dog flea, tick & worming, dog beds, dog collars, dog bark collars, dog toys and dog health care products. Cat supplies including cat flea & worming, cat scratch posts, cat food, cat collars. Aquarium supplies including aquarium filters, and aquarium air pumps. Reptile supplies including thermostats and heating supplies. Also use Afterpay to your bird products, small animal products, hermit crab supplies and horse products. Afterpay allows you to pay for your order fortnightly. Your order will be shipped immediately, just like a normal order. You can use it for all orders up to $1000.00. How Do I Use Afterpay at Checkout? All you need to do is select Afterpay as your payment method on the checkout page of our online pet shop and enter your details with Afterpay when you are done shopping. It's quick and simple! It is a Buy Now, Pay Later solution. You can pay for your goods right away and then pay it back to Afterpay in four installments. What fees are involved with using Afterpay? There are no upfront fees to you and if the installments are paid on time you will not be charged any feeds. If you fail to make a payment you will be charged a late fee of $10.00 and if still overdue an additional $7.00 will be charged one week later. The store you purchase from will pay a % of the sale to Afterpay allowing customers to use this service with their business. How much can I spend at one time with Afterpay? This will vary from account to account. The most a standard account can spend at one time is $1000.00, however not all users will have a limit this high. Can Afterpay be used in store or only online? It can be used both online and in store at retailers that accept it. It is a simple process to use it both online and in store. Can you Afterpay gift cards? At this time they do not allow retailers to sell gift cards using Afterpay. They make the bulk of their money from charging retailers percentage of the sale when Afterpay is used. If they charge a retailer 6% fee, on a $100.00 sale, Afterpay will take $6.00. We only sell pet supplies, however there are thousands of different stores in Australia that offer Afterpay. This is a list of stores that offer Afterpay. Are there any alternatives to Afterpay? 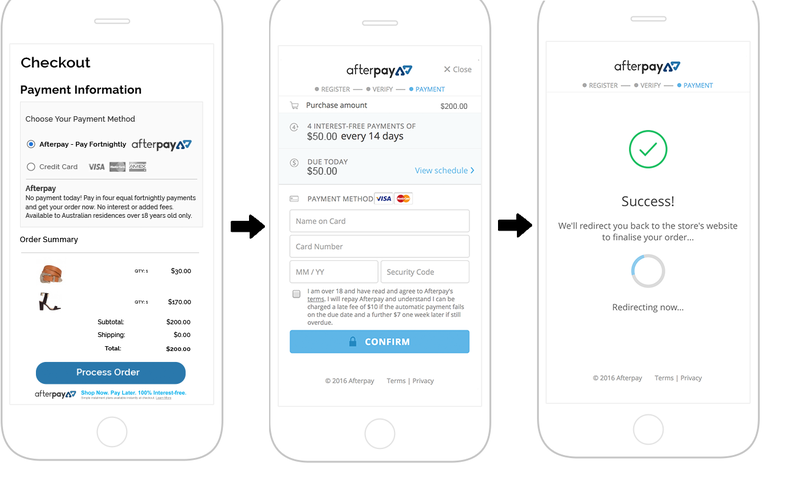 Yes, some similar services to Afterpay are zipPay (Zip), Oxipay and Openpay. Why has my Afterpay payment been declined? The retailer you are purchasing off cannot see as to why your Afterpay payment has been declined or won't work. In this case you will need to contact Afterpay. The payment arrangement is made with Afterpay and they will approve payments at the time of your order. For first time Afterpay customers the first payment will be charged at the time of purchase. Existing Afterpay customers, first payment will be charged 14 days from the date of purchase. The full payment schedule will be provided to you at time of purchase. If you wish to return your items you can choose to receive an exchange, or the Afterpay payment plan can be cancelled so you pay nothing. If you fail to make a payment you will be charged a late fee of $10.00 and if still overdue an additional $7.00 will be charged one week later. Credit limit varies from customer to customer. You may not be approved for the full AU $1,000.00 amount. Contact Afterpay for more info. Get products & supplies for dogs, cats, birds, aquariums, fish, reptiles, small animals with Afterpay.